Hey baby, won't you take a chance? This song is about (rather unsurprisingly) dancing with a lover. It is the title track to Let's Dance, which was produced by Nile Rodgers, who was responsible for the album's funky sound. Rodgers founded the disco band, Chic, and produced hits for Diana Ross, including "Upside Down" and "I'm Coming Out." He also produced Madonna's 1985 album Like a Virgin. Stevie Ray Vaughan played lead guitar on this song. Bowie was impressed when he saw Vaughan perform at the Montreaux Jazz festival a year earlier. When Vaughan received the call from Bowie to play on the record, he was (although not literally) in the middle of recording his own album, Texas Flood. This was Bowie's only transatlantic #1, a very upbeat song with mass appeal. He described it as "positive, emotional and uplifting." Said Bowie: "I tried to produce something that was warmer and more humanistic than anything I've done for a long time. Less emphasis on the nihilistic kind of statement." The official video was directed by David Mallet. It was filmed in Australia and features an Aboriginal couple who are struggling against Western cultural imperialism. 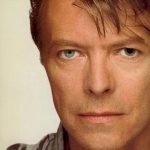 The video was described by Bowie as a "very simple, very direct" statement against racism. According to Mallet, they shot the bar scenes in the morning, which didn't go over well with the locals, who didn't appreciate Bowie and fashionable crew. Some of the patrons also resented the Aborigines who starred in the clip, and mocked them with their own dance moves. Mallet shot this on film and edited it into the video - the white people dancing in the bar were actually making fun of the couple. Red Shoes are a theme in the video and appear in the lyrics, "Put on your red shoes and dance the blues." This is a reference to the 1948 movie The Red Shoes, where a dancer performs in a ballet of that name. The idea is that the red shoes make you dance - it's based on a Hans Christian Andersen story of the same title. Kate Bush recorded a song about the same subject. The tour to support this album was called the "Serious Moonlight Tour," named after a line in this song: "Under the moonlight, the serious moonlight." Originally slated just for Europe, the tour was so successful that it was expanded to North America, Asia and Australia, often in large stadiums. Smashing Pumpkins covered this song in 1998 along with Joy Division's "Transmission" during a 25 minute live jam. Nile Rodgers said of this song in the 2013 film Davie Bowie: 5 Years in the Making of an Icon: "'Let's Dance' is not what I'd call a traditional dance record, but it's certainly a record that does make you want to dance. I thought to myself, 'Man, if I don't make a record that makes people want to dance, and we call the song Let's Dance, I'm going to have to trade in my black union card.'" Gnarls Barkley are digitally inserted into this video during their own video for "Smiley Faces." Nile Rodgers recalled to The Guardian May 18, 2012: "When Bowie and I got together to do Let's Dance, we spent two weeks researching music and styles and Bowie suddenly said: 'I got it!' He held up a Little Richard album cover where he's wearing a red suit, getting into a red Cadillac, with a pompadour haircut, and said: 'That's rock'n'roll.' After doing all that research with him, I got it too. I knew instantly what he wanted. We switched the suit for a yellow one when we released our record." Speaking with the Daily Telegraph July 30, 2013, Nile Rodgers recalled Bowie unveiling this song to him. "He says, 'Nile, darling, I think this is a hit,' and he proceeds to play what sounds like a folk song to me, with a twelve-string guitar," recalled the producer. Unable to tell Bowie that what he was playing was not dance music, Rodgers wrote an entire arrangement, taking it in "a funky direction." Said Rodgers: "I was like the Terminator, I was unstoppable, I just wanted to make hits with David." Bowie's brief cameo in the Ben Stiller film, Zoolander, is accompanied by this song. Craig David's 2007 UK Top 10 hit "Hot Stuff" extensively samples this song. Peter Lawless was the location finder for the music video. He was also the location finder/manager for the Matrix films, which were also filmed in Australia.